The 2016 Jeep Wrangler Unlimited may be the ultimate off-road SUV, capable of grabbing life by the horns and hitting the rough terrain at a moment's notice. When you are in need of a well-crafted American made vehicle, there may be no better option than a Jeep. At Lakeland Dodge we carry one of the largest inventories of the off-road vehicle in the entire area, and our staff of knowledgeable and friendly salespeople are ready to meet your every need. If you are in the Wesley Chapel, Tampa, Brandon, Wauchula, Brooksville, Orlando, St.Cloud, Kissimmee, and Winter Haven areas, stop by for a test drive today. The 2016 Jeep Wrangler Unlimited is a true off-road vehicle and isn't something that claims to love the rough terrain then brakes a nail during the first time out. With a 3.6-liter V6 24-valve VVT engine and a sports suspension, the Wrangler Unlimited offers power, handling and responsiveness in an SUV that does much more than just look intimidating. The Wrangler is just as comfortable running errands or going to work as it is on a back road, and the SUV offers a smooth and calm ride wherever you are on the road. The SUV also tows up to 3,500 lbs and provides a surprisingly solid fuel efficiency for such a big and strong crossover. We can talk about performance all day with the 2016 Wrangler Unlimited, but the best way to understand its true capabilities is with a test drive at Lakeland Dodge. All you have to do is stop by, and our expert Jeep representatives will be happy to grab the keys and hit the road. The 2016 Wrangler continues to be one of the most exceptional SUVs on the road and with a starting MSRP of $27,695 for the Sport trims, the Jeep also offers value on top of luxury. 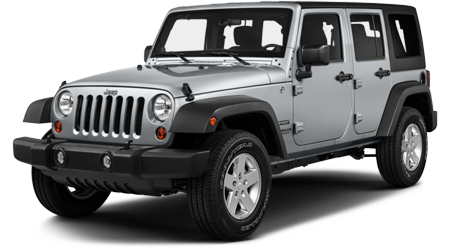 When you are in need of a crossover with enough power to go off the road with the responsiveness and acceleration of a smaller vehicle, the 2016 Jeep Wrangler can provide everything that a buyer might want from a new SUV. Visit us at Lakeland Dodge, to experience the Wrangler Unlimited firsthand if you are near the Wesley Chapel, Tampa, Brandon, Wauchula, Brooksville, Orlando, St.Cloud, Kissimmee, and Winter Haven areas. We are located at 2335 Highway 98 N, Lakeland, FL 33805 and house a team of friendly Jeep experts waiting to help get you into the right version of the 2016 Wrangler Unlimited today.